This club is in Neuva Anadalucia, just above Puerto Banus. This is an up-market area with a number of good golf clubs close together. 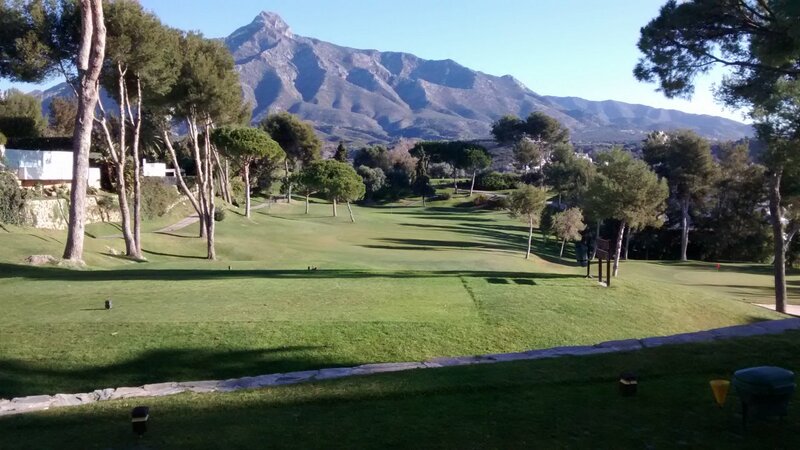 To the West, Aloha has as neighbouring courses Las Brisas, Los Naranjos, La Quinta and Guadalmina. These are all very well-established and busy clubs. The entire area has plenty of small villas and smart townhouses. Aloha sits at the top of a small valley. The very large clubhouse terrace has good views, although not quite high enough to have truly spectacular views over the Mediterranean. The clubhouse is quite large, modern design and split over three levels. Parking is OK but not ample – I have seen it full to overflowing on a busy day with several competitions going out. The food is good. The menu del dia I had there was decent quality and massive servings – I was completely full before I reached the dessert and coffee. More a full meal than your typical day-time Spanish set menu, so pricing very fair. Other people I know on the Costa del Sol also have very positive comments about the food at Aloha – whether for a light lunch or a full evening dining meal. Clubs like Aloha tend to have a bedrock of typical members. These are quite well-off people, bought a property and golf membership 10-15 years ago, tend to play the same course repeatedly, view golf as a relaxing way to spend retirement years rather than take very seriously, have quite high handicaps but are not bothered by that. Their entire lifestyle is financially comfortable, so they expect a good golf course but not necessarily a challenging course. A course like Aloha delivers that promise. 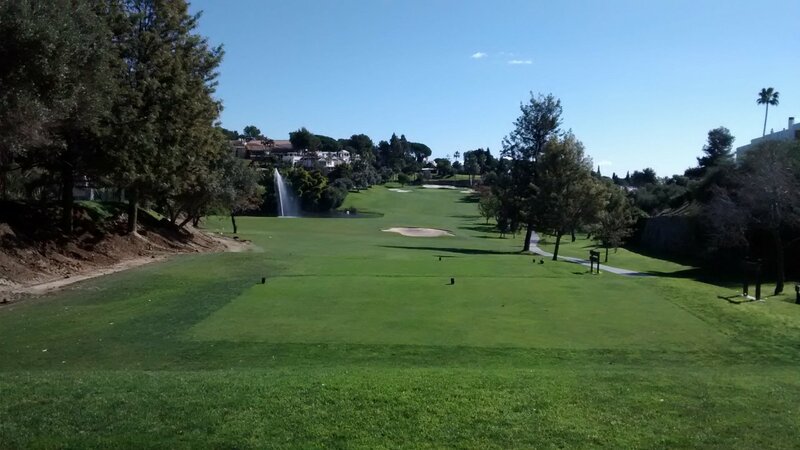 All golf clubs on the Costa del Sol have taken a knock with the Spanish economic boom/bust in 2008, but clubs like Aloha are not much affected. The grass everywhere on Aloha is good quality. I am not an expert on types of grass, but this is good stuff. They mow it to one level to provide decent fairways, off the fairways they mow the same grass slightly higher to provide very playable light rough, and finally they mow the same grass to a low level to provide excellent tee boxes. This makes for very consistent golf shots, unlike some lesser courses where the variety of grasses is a factor in how you try to play the ball. Up to 5 meters off the edge of the green, they let the grass grow slightly longer – to provide a soft surface to pitch off. All holes have moderate slope (across the fairway) and bunkers are positioned to catch golf balls that stray offline down the slope. There are also bunkers in the middle of some fairways right on your best line. These are usually about 170 meters out from the tee, so in my case a good drive sails straight over them. Even if you can not achieve that distance, there is a safe area to aim to avoid bunkers like that. All bunkers are not deep, have firm sand and are not difficult to get out of (you will very seldom find your ball badly plugged in a bunker). There is a mid-sized stream that runs through the course. This is heavily architected into water features such as ponds. The water is in play on about 6 holes. The trees on this course are lovely. Not just the usual ones you find on the Costa (pines, oaks, olives, gums) but a nice variety of other species as well. All mature and beautifully located. It is such a good long-term investment to do this type of tree planting. I just wish more clubs would do it. The wooden hole maps on each tee box are small and simple and the course map on the back of the scorecard is functional, nothing more. For a course at this level, they really should give some thought to better (bigger, more accurate) hole maps. All this makes the play up to the greens quite easy. Good width fairways, bunkers not too difficult, slope not severe, moderate incline along the fairways towards the green, light rough that is not difficult to play out of, etc. For a golfer with 15-20 handicap this is an excellent course to try to hit every green in regulation. Now what about the greens. These are medium-paced, have only subtle slopes, have good quality grass tightly mowed and are very receptive. Certainly not fast and difficult greens like some championship courses. 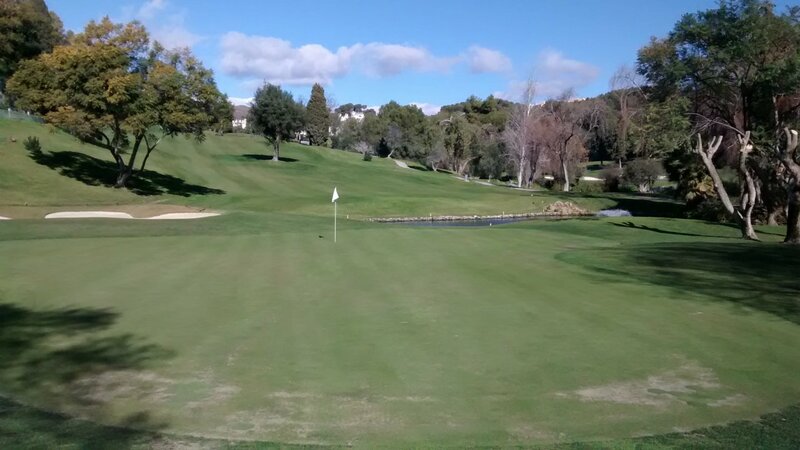 So the greens are a bit more challenging than the rest of the course, but are big enough to be forgiving – although you can still have a tricky two putts to get down. This is quality golf by deliberate design. Moderately easy to bogey every hole, but reasonably tough to par the hole. This exactly suits the typical member at Aloha. Players with higher handicap (say 25+) will be unlikely to lose golf balls here because no holes are designed to be really challenging. But a double-bogey on the par 4s and 5s is very likely for a player at that level. For the better golfers (handicap under 10) getting close to the green in regulation is not difficult at all, and if the approach shot is OK then a single putt is a definite target. So for that level of golfer, Aloha is not a big challenge. One word describes the whole Aloha setup: Comfortable. The strong membership know what they want and make sure the club delivers that for them. This is not a super-premium championship club/course, but a very nice 2nd-tier club/course. I think the cost of a round for a visiting player quite expensive (well over €100) and I think it about €20-€30 overpriced for what it is. But then for my own golfing experience I compare a course like this to other courses that cost quite a bit less. Aloha is not doing that comparison – it is comparing itself to courses like Las Brisas and Guadalmina. On that basis, the pricing at Aloha is fair. Not a course that I go back to regularly (unless perhaps I can get a good price through a golf society or knowing a member), but still recommended if you are not too worried about how much the round is costing you. In which case you will find Aloha relaxed, pleasant and comfortable. A good day out on a pretty course. Aloha is represented by the yellow dot. This shows that Aloha is 'top 10' in length compared to all other courses on the Costa del Sol, but is only average in terms of difficulty. An 18-handicap player can expect to go around this course between 19 and 20 over par.